So I was sitting in the Blogger’s Cafe and realized that the person sitting near me had a guitar out. He was strumming and noticed my ‘Rock Star’ ribbon on my badge. He then explained that he was playing guitar on his iPod touch and oh boy was I intrigued! I went over to investigate. Before I knew it I was playing along. How Does One Use This Toy for Education? Kevin Honeycutt (http://kevinhoneycutt.org) says that he teaches on the iPod touch and then shows the kids the guitar, explaining the similarities. The applications use the same basic musical knowledge (chord names and rhythms) that a student must know to be a successful musician. He said that he hooks more than one iPod up to a jack and then connects them to a computer. The computer is running GarageBand, and by simply choosing the ‘Real Instrument’ option the kids can record right into GarageBand! 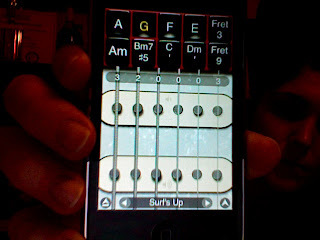 iShred – Has songs pre-installed with chords set up for you to strum. It’s so easy a child could do it! He turned the Blogger’s Cafe into a music lounge and got lots of people of varying ages to give it a try! you imagine when these sorts of fun learning apps come of age? I love that you call them 'learning apps,' Kevin. I think we need to move away from calling them 'toys' and begin finding ways to use them to engage students.BBat50–enjoy your new phone! I still have the old one. You can use an iPod Touch to use this app, too.Thanks for checking out the blog!